PATUXENT RIVER, Md. --- The Navy and Marine Corps' newest small unmanned aircraft system RQ-21A Blackjack began its initial operational test and evaluation (IOT&E) in early January at Marine Corps Air Ground Combat Center Twentynine Palms, Calif.
As part of IOT&E, this first low-rate initial production (LRIP) lot of the Blackjack, previously known as RQ-21A Small Tactical Unmanned Aircraft System (STUAS), will demonstrate the system’s effectiveness and suitability in realistic combat conditions. 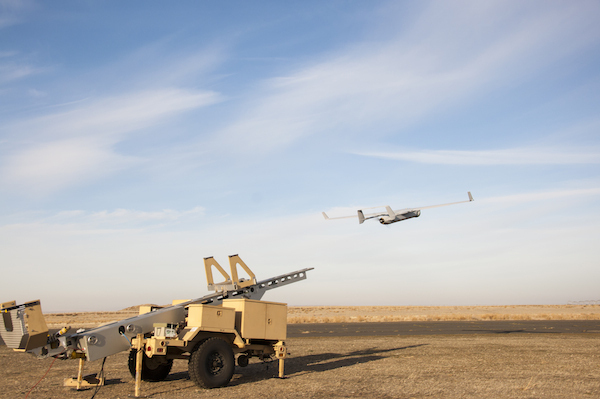 The Insitu Inc.-built Blackjack is a larger twin-tailed follow-on to the ScanEagle unmanned air vehicle. The system contains five air vehicles, two ground control systems, and launch and recovery equipment. Air Test and Evaluation Squadron (VX) 1 is conducting ground and shipboard testing on Blackjack for the next several months. 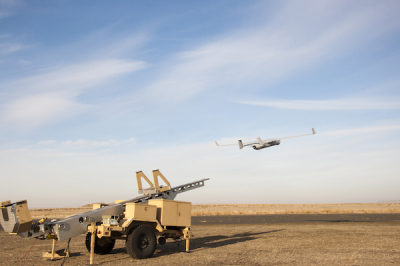 After completing IOT&E, the government and Insitu team will transition the system to Marine Unmanned Aerial Vehicle Squadron (VMU) 2, located at Marine Corps Air Station Cherry Point, N.C. for operational use. A second LRIP lot, consisting of one system, is scheduled for delivery in the spring. Lt. Col. Anthony Bolden, commanding officer for VMU-2, said the myriad of capabilities that come with the introduction of Blackjack will provide the Marine Air-Ground Task Force (MAGTF) with a platform that has the payload and persistence to significantly enhance situational awareness. At eight feet long and with a wingspan of 16 feet, Blackjack provides intelligence, surveillance, reconnaissance and communications relay to the warfighter on land and at sea. The air vehicle’s open-architecture configuration can integrate new payloads quickly and can carry sensor payloads as heavy as 25 pounds. Standard payloads include day and night full-motion video cameras, an infrared marker, a laser range finder, a communications relay package and automatic identification system receivers.